* These wholesale wedding earrings have vintage cz detail and crystal faceted teardrops for the ideal bridal, bridesmaid or prom earrings at a great price! * Vintage CZ detail in the top of these wholesale wedding earrings are combined with genuine Austrian crystal faceted teardrops to make these luxurious earrings ideal bridal, bridesmaid or prom earrings at a great price. 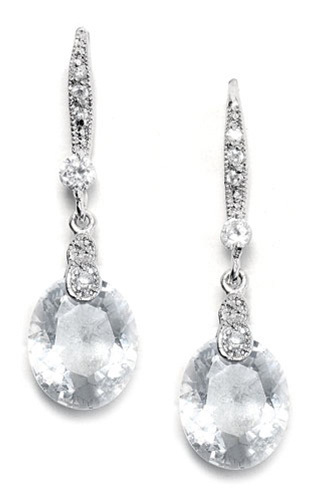 * These silver rhodium earrings measure 1 1/4" h.